While police officers were sweeping the city for high-level terrorist activity in Brussels, Belgium, residents filled Twitter with cat pictures to uplift the mood of the teams on the street and the people behind closed doors. Authorities locked down the Belgian capital city over the weekend after intelligence reports hinted of a suspected terrorist presence in the city, prompting the police to execute raids in search of high-profile fugitives believed to have been among the perpetrators of the terrorist attacks in Paris. The city is still under the highest security alert level, but schools and subways will gradually reopen on Wednesday. Citizens were instructed to avoid busy public places such as malls, schools and subways; many were forced to stay indoors. 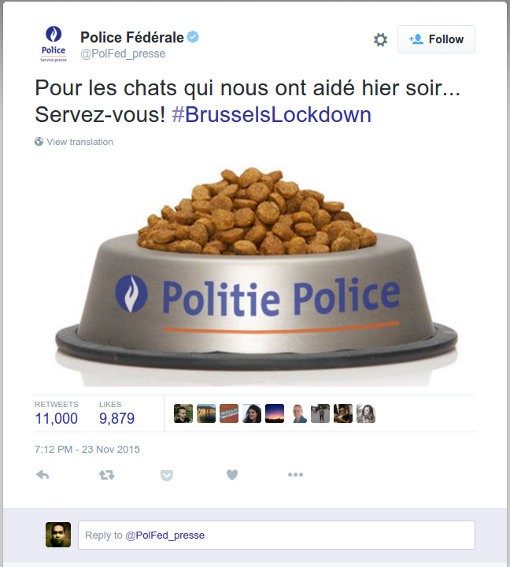 Belgian police urged citizens to avoid talking about the lockdown or posting about it on Twitter via the hashtag #BrusselsLockdown in order to keep the suspects in the dark about the ongoing police operations. But Twitter wouldn’t be Twitter if it were silent. Obliging their city officials’ pleas, Brussels residents stormed Twitter with photos of cats and kittens instead. What terrorist could find details about the Belgian police activities beneath that huge heap of cute little furballs? The cat memes also helped defuse mounting tension and anxiety among those who locked themselves in the safety of their own homes. 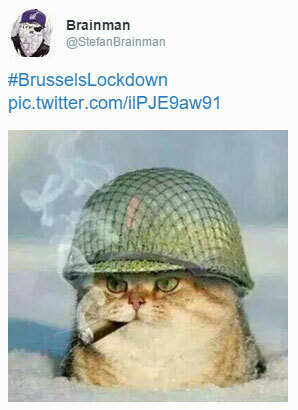 Through the hashtag #BrusselsLockdown, Twitter users in Brussels posted a variety of cat photos such as kittens in military outfits, a kitten looking out the window with a sniper rifle, a cat rescuing another cat, a cat flipping the pages of the book “The Art of Military Strategy,” a picture of police officers riding a hovercat and many other creative photos of feline cuteness. In a press conference on Sunday, the Federal Prosecutor’s Office and police services publicly expressed gratitude to the press and social media users for faithfully cooperating during the lockdown operations.